Today is my baby girl's 4th birthday!!! I feel like I was just writing the post about the peach cobbler I HAD to bake just before she was born, and here we are 4 years later. Time is going way too fast! It is so hard to remember my life before she was in it. She has brought so much joy, love, and craziness to our life and home - I just wish time would slow down. Since today is going to be a fun day (actually, a fun day to kick off several days of fun birthday things! 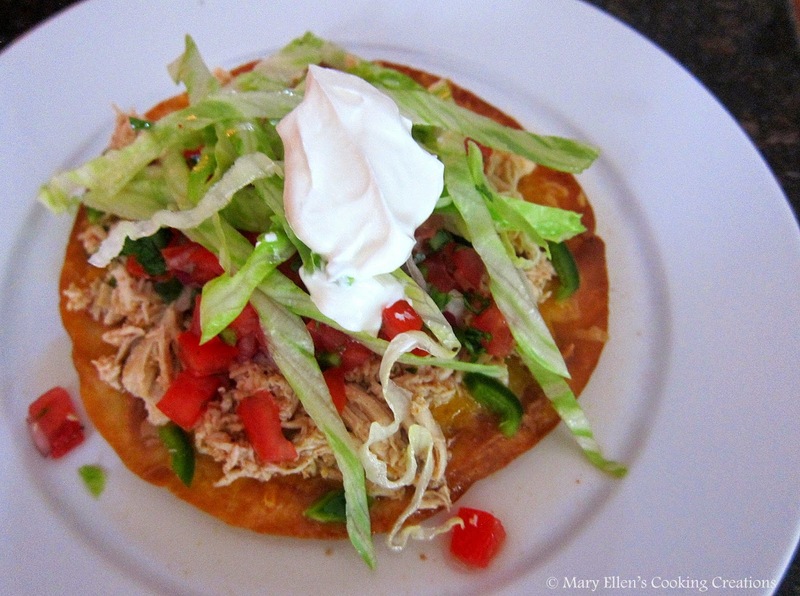 ), I'm sharing a fun dinner - Chicken Tostadas. 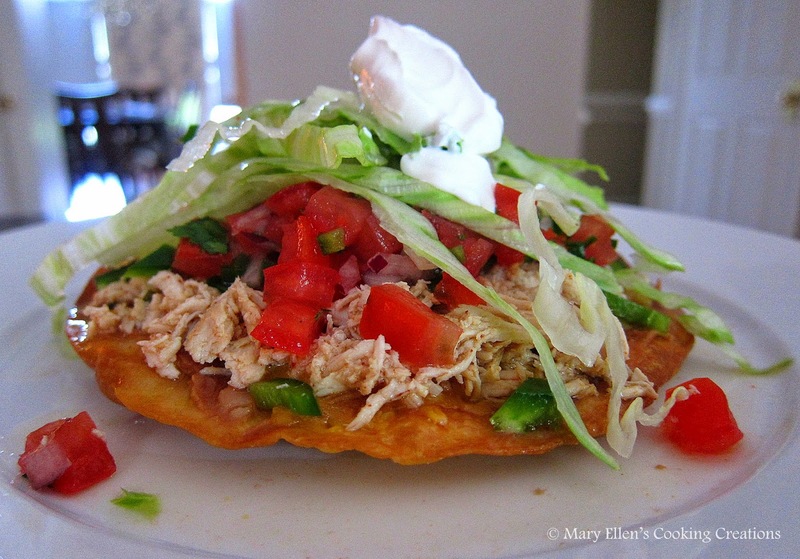 I've had these a few times in Mexican restaurants and when trying to think of what to do with shredded chicken, tostadas came to mind. We all loved them and I'm sure I will turn to these often when looking for something fun and easy. So much prep can be done beforehand and everyone can assemble their own tostadas and choose their own toppings. I read a recipe on the Food Network site and followed the basic instructions on how to fry the tortillas and spread on the beans. As far as toppings, I chose to make some of my Pico de Gallo - I knew my husband would like that a lot better than chopped tomatoes. What I liked best about making this dinner was that I cooked and shredded the chicken the night before so when it came time to make dinner, all I had to do was fry the tortillas and assemble them. Definitely an easy weeknight meal! Cook the chicken: place chicken breasts in a pot and cover with water. Season the water generously with chili powder, cumin, cayenne, garlic powder and onion powder. Cook over medium heat until chicken is done. Transfer to a KitchenAid mixer and shred or shred using 2 forks. Cover and refrigerate until ready to use; I warmed the chicken in a pan with just a small amount of broth. Pour a layer of vegetable oil - about 1/3 inch deep) into a frying pan and heat over high heat. Add the tortilla and cook about 45 seconds per side, or until golden brown and crispy. Transfer to a dish lined with paper towels and let excess oil drip off. Transfer the tortilla to a baking sheet and spoon refried beans on, spreading them in an even layer. Top with the shredded cheddar cheese and place under the broiler until the cheese is melted, about 30 seconds. Add your toppings - chicken, pico, jalapenos, lettuce, sour cream, queso fresco, and anything else you like. So, now I need to know: How do you EAT this? Pick it up and chomp? So no picking up and eating whole?